Only 10 to 11 ft. Long, berkeley sports cars had tiny motorcycle-type engines sufficient in performance to earn one specimen class wins in the 1959 mille miglia and monza 12 hours races, defeating several abarths, among others. 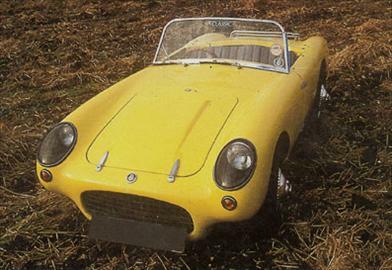 But because prospective customers could buy a real car for the same price in the new austin-healey sprite, only about 3,000 berkeleys were sold. Built by trailer manufacturer berkeleys were designed by lawrence bond and built by the berkeley coachwork co., manufacturer of trailers, with an alloy-reinforced fiberglass body bonded to a steel chassis. The transversely mounted engines had two or three cylinders, the transmission had a gearshift lever that moved forward and back, like a motorcycles, and final drive was by chain to the front wheels. The coil-spring suspension was fully independent. mini-ferrari look most berkeleys were two-seat roadsters that resembled mini-ferraris and came with optional detachable hardtop. At least one of these provided a tiny rumble seat. There was also a hardtop coupe and even a four-seater on a longer chassis. Berkeley promised 60 mpg fuel economy, vivid acceleration and boundless capacity for fun. The berkeley was a tiny sports car that resembled a miniature ferrari. This roadster could reach 85 mph.